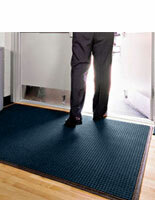 These 3’ x 4’ blue entry mats are rectangular and feature a raised surface texture that prevents passersby from slipping. 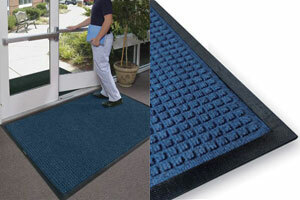 Each doormat is made of absorbent polypropylene fibers that will trap dirt, mud and water from shoes. 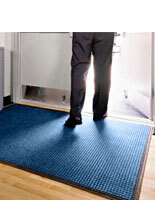 This makes the blue entry mats a great option as lobby rugs and entrance carpets because they help keep flooring clean. 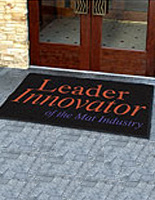 The doormats also feature a rubber bottom surface that resists slipping for additional safety. 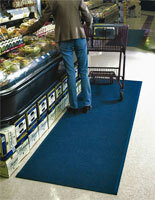 The rectangular entry mats feature a neutral finish that makes them great for schools, factories, hotels and offices. 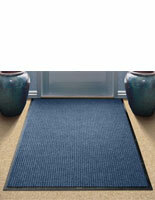 The absorbent entrance carpets are als oavailable in charcoal, gray and navy blue. This entry mat is anti-static rated at 1.2KV by the AATCC and Certified Slip Resistant by the National Floor Safety Institute!